Are you ready for one of the most amazing Music Festivals in the whole world? 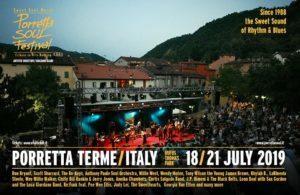 Porretta Soul Fest 2019 gonna be from 18th till 21st July, and we are honored to say that we will perform there with Leon Beal and The Luca Giordano Band with Sax Gordon & Horns!!! After Porretta Soul Fest dont forget The Valley Of Soul!!! You can find us performing in some beautiful little towns around Porretta area.